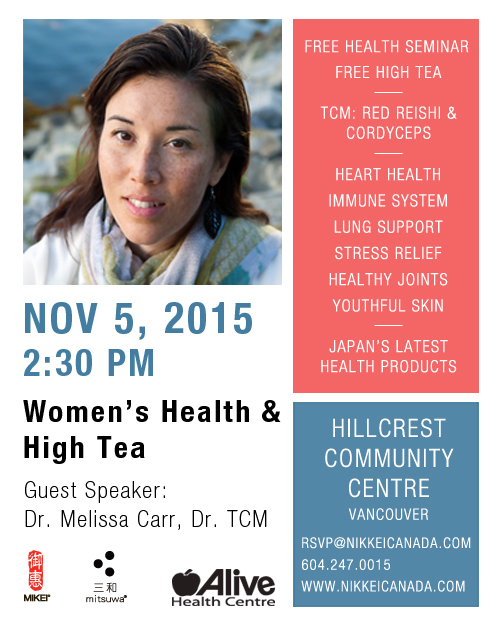 Women’s Health & High Tea with Dr. Melissa Carr, Dr.TCM Hosted by the distributor of Mikei® Red Reishi and Mitsuwa® Collagen Pure, join us for high tea with Dr. Melissa Carr to learn the importance of disease prevention using Traditional Chinese Medicine’s most powerful herbs, red reishi and cordyceps. We’ll also cover the benefits of collagen and will showcase the latest health products from Japan. BONUS: Door prizes and a chance to win one of 10 tickets to the Vancouver Health Show!  How red reishi and cordyceps can be used for women’s health issues.  The importance of collagen for maintaining healthy joints, shiny hair, and glowing skin. Cost: FREE! Complimentary high tea will be provided.